Marie-Henri Beyle (January 23, 1783 – March 23, 1842), better known by his penname Stendhal, was a nineteenth century French writer and novelist. He is known for his acute analysis of his characters' psychology and for the dryness of his writing style. Stendhal is considered one of the foremost and earliest practitioners of the realistic form. Prior to Stendhal, the vast majority of novelists used a highly exaggerate rated and melodramatic Romantic style, which lent itself well to romances and Gothic horror, but was inadequate for depicting the contemporary and increasingly urban world. Stendhal's writing style is realistic in the sense that offers a penetrating and almost scientific view of the thought processes of his characters, and his model would prove to be an exemplar for generations of novelists attempting to create verisimilitude in their writing. The great movement of Russian realism in the second half of the nineteenth century owes an immense debt to Stendhal, as do the French realist novelists Honore de Balzac, Gustave Flaubert, and Emile Zola, who would emerge in Stendhal's wake. Moreover, the English and American modern novelists of the early twentieth century, such as Ernest Hemingway, F. Scott Fitzgerald, and Virginia Woolf would all acknowledge their debt to Stendhal for bringing about the style of the incisively objective and modern psychological novel. In his most famous novel, The Red and the Black, Stendhal would not only create a new literary technique, moving the narrative inside the character's mind, but also created a new kind of protagonist, the urban social-climber. Julien Sorel is a new character for a new age, in which the "natural" aristocracy has broken down, and is in the process of being replaced by a new elite who idealize Napoleon Bonaparte and succeed based on their skill and cunning. Born in 1783 in Grenoble, France, Stendhal was the son of Cherubin Beyle, a provincial barrister. Stendhal's mother died early on in his life, and the loss affected him deeply. In later life he would portray his childhood as stifled and depressing, and a great deal of his early career was shaped by his ardent desire to escape his father and the provinces. In 1799, the teenage Stendhal got his wish, traveling to Paris, ostensibly to pursue an academic career in mathematics. His diaries show, however, that he had been nursing a secret plan to become a playwright. He dreamed of become a "modern Jean-Baptiste Moliere," but his plans were soon interrupted by some wealthy relatives, who had him appointed second lieutenant in the French army stationed in Italy. In Italy, Stendhal discovered Lombardy, Milan, and the culture of the Italian people with whom he fell in love. His Italian experiences would dramatically shape the rest of his career. In 1806 Stendhal was appointed to an administrative position in Brunswick, Germany. The position gave Stendhal the time and funds to continue work on his youthful writing projects, while at the same granting him a bird's eye view of Europe in the midst of the Napoleonic Wars which would form such an important foundation for his own fiction. In 1814, with the collapse of the French Empire, Stendhal retreated to his beloved Italy, where his literary career would first truly begin. Life in Milan proved a boon to Stendhal. He became acquainted with a number of literary and artistic circles in the cosmopolitan city, and found himself quickly employed writing books on Wolfgang Amadeus Mozart, Joseph Haydn, Metastasio, and Italian painting. During this period he also authored a travel book, for the first time using the penname "Stendhal," supposedly chosen as an anagram of "Shetland" (although Georges Perec may have invented this explanation). Alternatively, some scholars believe he borrowed the moniker from the German city of Stendal as a homage to Johann Joachim Winckelmann. 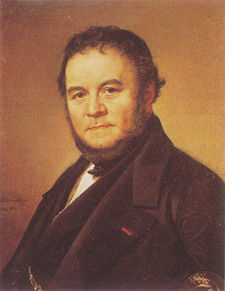 In 1821 the Austrians, who controlled northern Italy at that time, began to put pressure on Stendhal because of his past connections with the French Empire, and ultimately he was forced to flee to Paris to escape persecution. In Paris he became popular in salons as a conversationalist and wit; he was well known for his ability to lampoon his intellectual rivals, and became something of a literary celebrity. He continued to write, publishing a book on the "objective study of love" entitled De l'amour ("On Love") in 1822 and, a year later, began serial publication of a study of Jean Racine and William Shakespeare. In 1827 he published his first novel, Armance, as well as a biography of Gioacchino Rossini. Three years later, however, would be a turning point in Stendhal's career, with the publication of his first masterpiece Le rouge et la noir ("The Red and The Black"). In 1830 the July Revolution reinstated King Louis Philippe to the throne of France, and Stendhal found himself once again in the favor of the ruling political party. He was appointed as a consul to the Papal city of Civitavecchia, which, unfortunately, he found to be a punishment rather than a reward. The position entailed an endless amount of administrative paper shuffling, Stendhal found the town itself to be isolated and droll, and the ultimate consequence of this appointment was the great writer found it almost impossible to write. Lonely and bored, Stendhal turned to writing autobiographical works, two memoirs entitled Souvenirs d'Egotisme and Vie de Henri Brulard ("Memoirs of an Egoist" and "The Life of Henri Brulard") and an autobiographical novel, Lucien Leuwen, none of which he would finish, but which, when published nearly 60 years after his death in their incomplete form, were heralded as some of his finest writings. During his time with the consulate, Stendhal uncovered records of crimes of passion and frightful executions during the time of the Renaissance which would become an inspiration for a series of short stories he published during this period. It was not until 1836, however, when Stendhal at last returned to Paris, that he had the stamina to resume serious intellectual work. In 1839 he published his second masterpiece, Le Chartreuse de Parme ("The Charterhouse of Parma"). He began work on a third major work, but died of a stroke in 1842 before it was completed. Contemporary readers did not fully appreciate Stendhal's realistic style during the Romantic period in which he lived; he was not fully appreciated until the beginning of the twentieth century. He dedicated his writing to "the Happy Few," referring to those who would one day recognize his own genius. Today, Stendhal's works attract attention for their irony, their psychological complexity and their historical insights. Stendhal was an avid fan of music, particularly the composers Domenico Cimarosa, Wolfgang Amadeus Mozart, and Gioacchino Rossini, the latter of whom was the subject of an extensive biography, now more valued for Stendhal's wide-ranging musical criticism than for its historical accuracy. Le Rouge et le Noir (The Red and the Black) is Stendhal's first masterpiece and a major work of realist literature. The title has been translated into English variously as Scarlet and Black, Red and Black, and The Red and the Black. It is set in 1830s France, relating the attempts of a young man to rise above his plebeian birth through deception and hypocrisy, only to find himself betrayed by his own passions. As in Stendhal's later work La Chartreuse de Parme, the protagonist, Julien Sorel, believes himself to be a driven and intelligent man, but is in reality a simpleton, a romantic, and a piece in a chess game played by others. Stendhal uses his addled hero to satirize French society of the time, particularly the hypocrisy and materialism of its aristocracy and of the Catholic Church, and to foretell a radical change in French society that will remove both of those forces from their positions of power. The most common and most likely explanation of the title is that red and black are the contrasting colors of the army uniform of the times and of the robes of priests, respectively. However, the symbolic resonances of the colors in the title could include red for love, and black for death and mourning; or red and black as the colors of the roulette wheel may indicate the unexpected changes in the hero's career. The Red and the Black is the story of Julien Sorel, the aesthete son of a carpenter in the fictional French village of Verrières, and his attempts to overcome his poor birth through posturing and telling people what they want to hear. The novel comprises two “books,” but each book has two major stories within it. The first book introduces Julien, a romantic youth who spends his time with his nose in books or daydreaming about being in Napoleon’s (by then defunct) army rather than working with his carpenter father and brothers, who beat him for his pseudo-intellectual tendencies. Julien ends up becoming an acolyte for the local Catholic Abbé, who later secures him a post as tutor for the children of the Mayor of Verrières, M. de Rênal. Julien acts as a pious cleric, but in reality has little interest in the Bible beyond its literary value and the way he can use memorized passages to impress important people. Over time, Julien begins an affair with the wife of M. de Rênal, one that ends badly when the affair is exposed throughout the town by a servant, Eliza, who had designs of her own on Julien. M. de Rênal then banishes Julien, who moves on to a seminary that he finds cliquish and stifling. The director of the seminary, M. Pirard, takes a liking to Julien, and when M. Pirard leaves the seminary in disgust at the political machinations of the Church’s hierarchy, he recommends Julien as a candidate for secretary to the diplomat and reactionary M. de la Mole. Book II chronicles Julien’s time in Paris with the family of M. de la Mole. Julien tries to participate in the high society of Paris, but the nobles look down on him as something of a novelty — a poor-born intellectual. Julien, meanwhile, finds himself torn between his ambitions to rise in society and his disgust at the base materialism and hypocrisy of the Parisian nobility. Mathilde de la Mole, the daughter of Julien’s boss, seduces Julien, and the two begin a comical on-again, off-again affair, one that Julien feeds by feigning disinterest in Mathilde at one point and using the letters written by a lothario he knows to woo a widow in the de la Mole’s social circle. Eventually, Julien and Mathilde reunite when she reveals she is pregnant with his child. M. de la Mole is livid at the news, but relents and grants Julien a stipend, a place in the army, and his grudging blessing to marry his daughter. But M. de la Mole relents when he receives a letter from Mme. de Rênal warning him that Julien is nothing but a cad and a social climber who preys on vulnerable women. (In a perfect example of irony, Julien had suggested to M. de la Mole that he write to Mme. de Rênal for a character reference.) On learning of this treachery and M. de la Mole’s decision to rescind all he had granted the couple, Julien races back to Verrières, buys bullets for his pistols, heads to the church, and shoots Mme. de Rênal twice—missing once and hitting her shoulder blade the second time—during Mass. Although Mme. de Rênal lives, Julien is sentenced to death, in part due to his own rambling, anti-patrician speech at his trial. Mathilde attempts to bribe a high official to sway the judgment against Julien, but the trial is presided over by a former romantic rival for Mme. de Rênal’s affections. The last few chapters show Julien in prison, reconsidering all of his actions over the three years during which the story takes place and considering his place in the world and the nature of society. Mme. de Rênal forgives Julien, and she and Mathilde both attempt to bribe and cajole local officials to overturn Julien’s death sentence. Julien’s affections, meanwhile, have returned to Mme. de Rênal. The novel closes with Julien’s execution; Mme. de Rênal, who pledged to Julien that she would not take her own life and that she would care for Mathilde’s baby, dies three days later, most likely of grief. The Charterhouse of Parma is one of Stendhal's two acknowledged masterworks. The novel is another early example of realism, in stark contrast to the Romantic style popular while Stendhal was writing. It is considered by many authors to be a truly seminal work; Honoré de Balzac considered it the most significant novel of his time; André Gide thought it the greatest French novel ever. Leo Tolstoy was heavily influenced by Stendhal's famous treatment of the Battle of Waterloo, where his protagonist wanders about in confusion over whether or not he has been in "a real battle." A "writer's writer," Stendhal is known more in literary circles than to the public at large. Many writers have acknowledged his influence on their work and used his technique of detailed psychological description in their own stories. Leo Tolstoy considered Stendhal an enormous influence. Gide felt that The Red and the Black was a novel far ahead of its time, and called it a novel for readers in the twentieth century. Emile Zola and his fellow French realists considered Stendhal the founder of their movement. At the time Stendhal wrote The Red and the Black, the prose in novels included dialogue or omniscient descriptions, but Stendhal's great contribution was to move the narration inside the characters' heads, describing their feelings and emotions, through the use of techniques like interior monologue. As a result of this book, Stendhal is considered the inventor of the psychological novel. Stendhal's style was highly allusive, with copious references to the works of Voltaire, Friedrich Schiller, and William Shakespeare; quotes from Jean Racine's play Phèdre and Don Juan; and to philosophers and thinkers who influenced Stendhal, such as John Locke and Jean-Jacques Rousseau. This page was last modified on 21 October 2015, at 15:57.